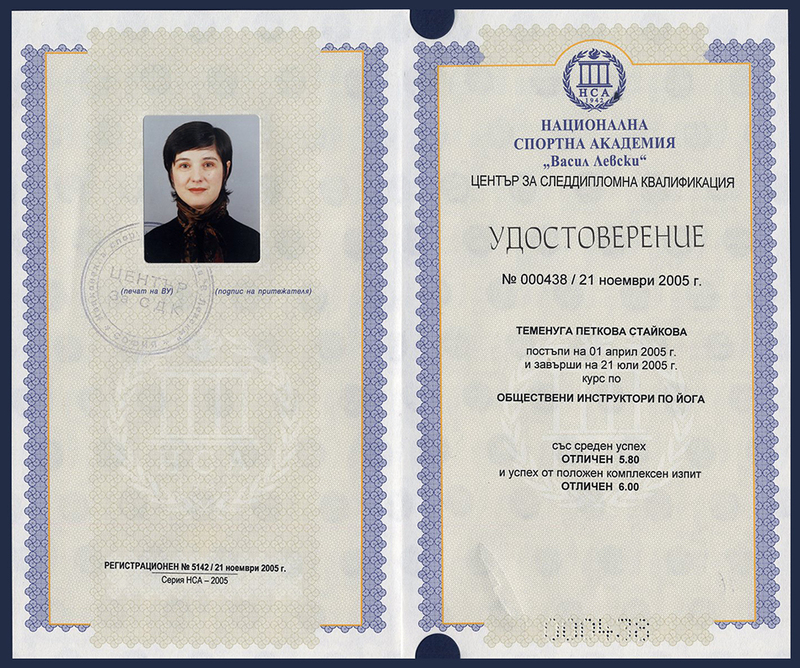 Tejomaya is a professional pedagogue. At the age of 26 she starts to attend the yoga classes of Vencislav Evtimov for about a year. From the spring of 1997 she continues her regular yoga practices with Ani Pavlova. During October 2001 – January 2002 she takes a 4-month yoga course at Bihar Yoga Bharati, India. There she is initiated into karma sannyasa. Tejomaya is her spiritual name (from Sanskrit – filled with light and radiance). The name suggests that the person works well with people and has the potential to inspire, i.e. that they can successfully be a teacher or an advisor. Furthermore, they have the inner desire to serve others with consistency and diligence. What a better way for self-fulfillment than being a yoga teacher. She has never doubted that she wants to do this. With the blessing of her guru Paramahamsa Niranjanananda Saraswati after she comes back to Bulgaria she starts teaching yoga practices for small groups. For Tejomaya, teaching yoga is interchanging energies, a way for people to learn, develop and grow together. This is one of her dreams happened. Helping people feel better is her vocation. In her personal quests she reaches to the conclusion that everyone should share their pursuits and experience, no matter how insignificant they may be in order to grow spiritually and to develop. She is aware that this is a huge responsibility and that motivates her for trying to improve herself better and better. She spends a great deal of time and energy for professional growth and personal transformation. 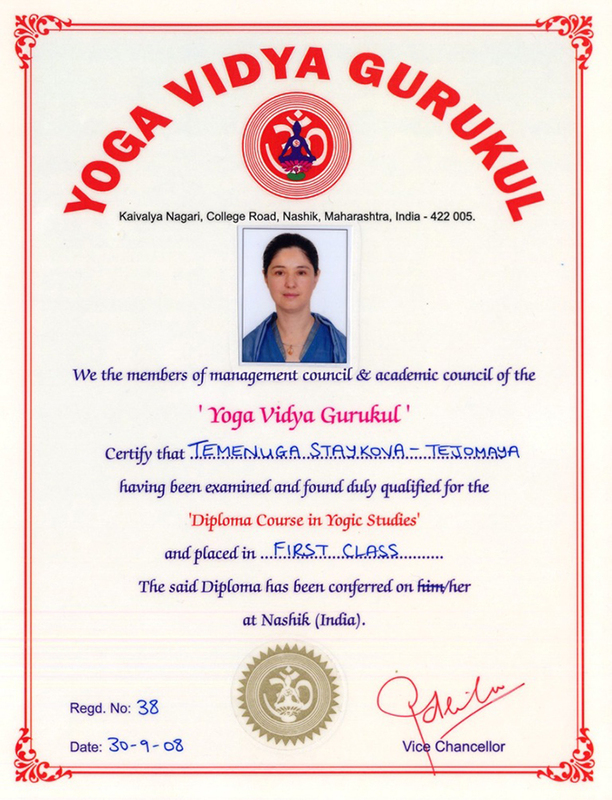 Almost every year she takes a qualification course on yoga teaching. 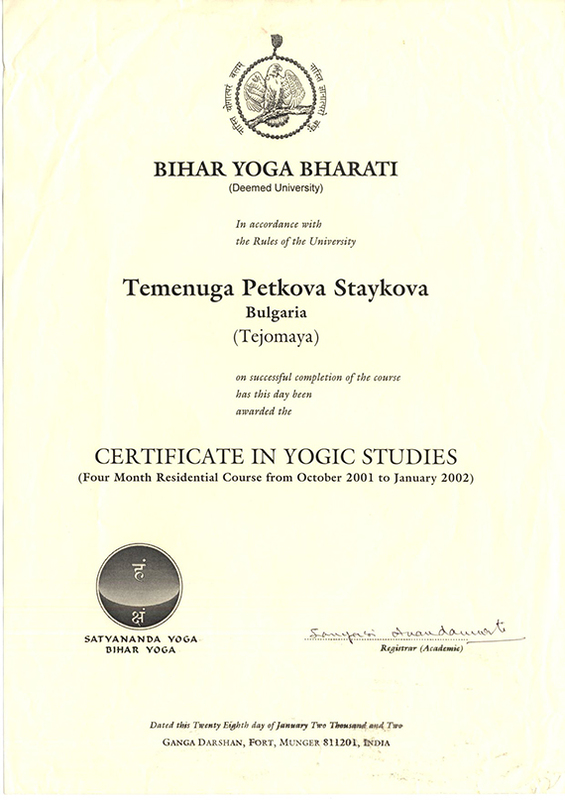 She participates in courses, seminars and events organized by the Bulgarian Yoga Association. At least once a year she visits Satyananda ashrams in India where the focus is on karma yoga and selfless service. She travels a lot to different parts of the world and attends ashrams, spiritual centers, temples, highly energized places of pilgrimage. She gladly shares her inspiration, impressions and wisdom, kindling the spark of light in those who seek it. 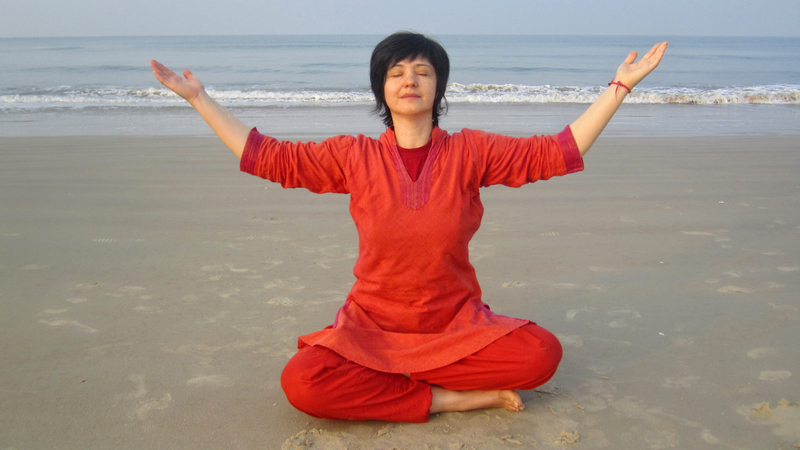 In her teaching she uses the methods of Satyananda yoga. This system provides the scientifically explained ancient knowledge of yoga in a very clear and understandable manner. The focus is on realizing and achieving a deep personal transformation not only on a physical level. The practices are suitable for all on a physical level, but at the same time there is a great depth of experience on a mental and emotional level. The approach is integral. It includes asana, pranayama, yoga nidra, meditations, shatkarma. The integral approach is exactly what attracts Tejomaya. Achieving the subtle balance between body, mind and emotion is the aim of her quest and her personal goal. She is also interested in ayurveda. She thinks that yoga and ayurveda are absolutely interrelated and that combining them is necessary in order to experience the full effect of the yoga practices. Besides the yoga courses, Tejomaya conducts individual yoga classes focused on yoga therapy; prepares a complex of individual practices, according to the specific needs. 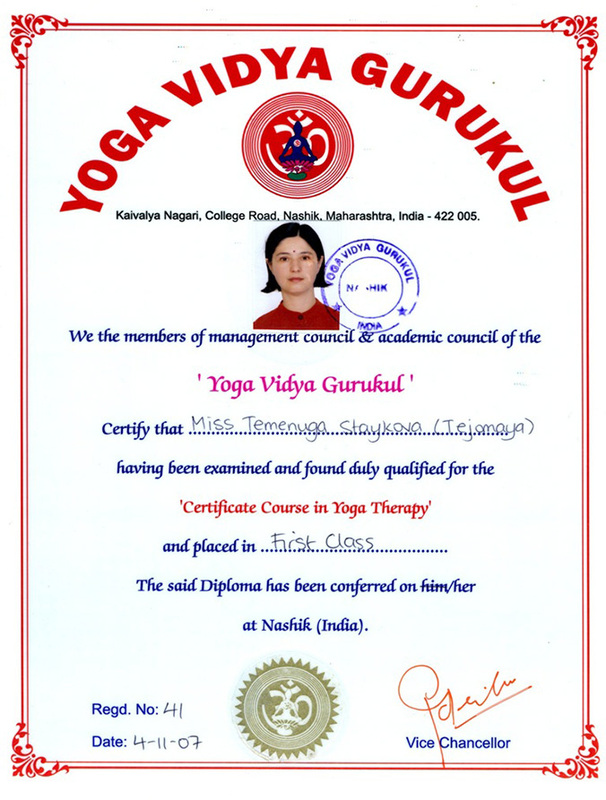 Moreover, she conducts yoga events which deal in greater depth with topics outside the regular practices. Her favourite subject is working on the emotions and the mind. She has diplomas for a 4-month Certificate course in Bihar Yoga Bharati, India – 2002, a Course for yoga instructors from the National Sport Academy – 2005, a Certificate Course in Yoga therapy – 2007; a Diploma course in Yogic studies from Yoga Vidya Gharkul, India – 2008; Yogic Studies 2 from the European Satyananda Yoga Academy – 2009; Тeacher training 1 from the Yoga Academy in North America, USA – 2011; and Тeacher training 2 from the Yoga Academy in North America, USA – 2013.